We love peonies and there’s nothing more powerful than these beauties as they can instantly live up our workspace and our mood! We’ve got these regal Martha peonies in coral straight from the local flower market and it’s worth every cent of the splurge! With the sub-tropical thunderstorms and high depression warnings bringing in dark clouds and heavy rain, these peonies are probably the last batch of the season. To make this bunch a little more interesting, we bought a few hardy little white and pink flowers to go with them. And with a yard or so of champagne grosgrain ribbon, and voila! 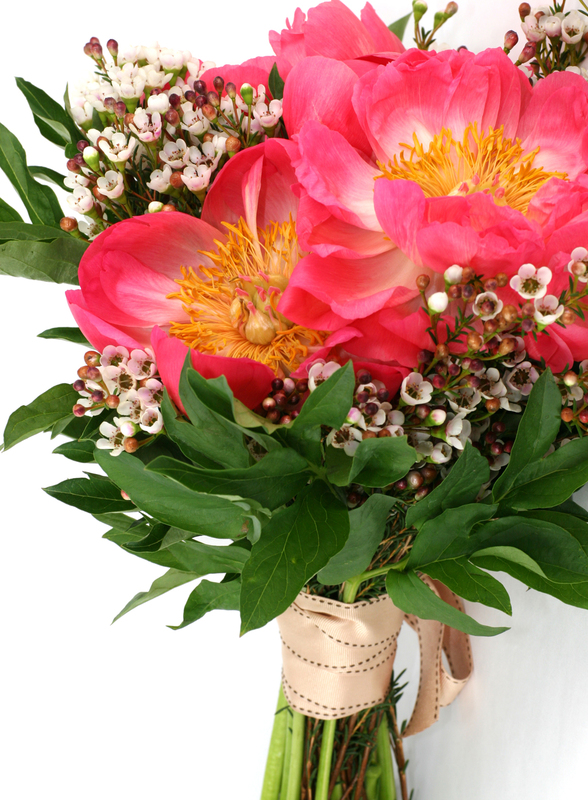 our own peony bouquet to brighten our space. Hopefully, this bunch will last for a few days in our air con blessed workspace.